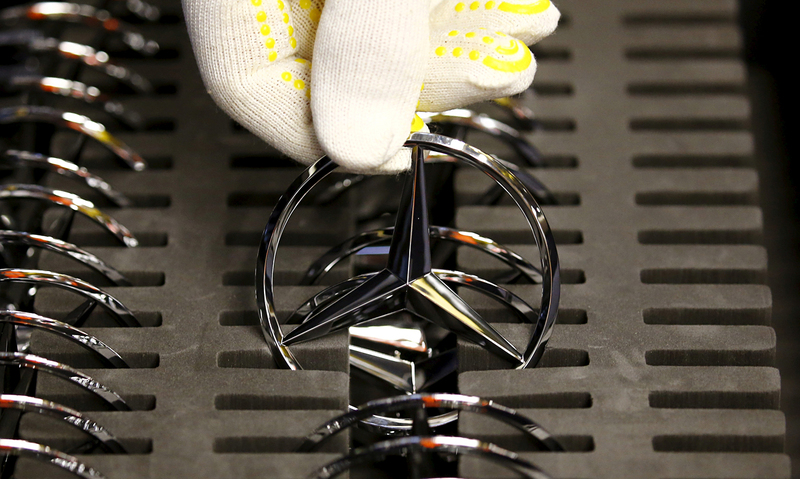 An employee of German car manufacturer Mercedes-Benz takes the brand's charateristic star to assemble onto a GLA model at their production line at the factory in Rastatt, Germany, January 22, 2016. More foreign automobile companies are looking to expand exports of their vehicle models manufactured in Russia, as the domestic Russian auto market shrinks. German company Daimler, parent company of Mercedes-Benz, plans to sign an investment contract to construct an auto manufacturing plant in Moscow region. Construction is expected to cost more than 300 million euros, according to Russia’s Minister of Industry and Trade Denis Manturov, who spoke (in Russian) with journalists on November 7th. The investment project will be signed by the end of the year, said Manturov. The plant will produce premium class SUVs, with an anticipated production volume of 25,000-30,000 vehicles per year. Mercedes-Benz is considering the possibility of assembly production of cars in Russia and is involved in consultations and conversations with Russian officials, the press service of Mercedes-Benz Russia confirmed to RBTH. "If all goes according to plan, Mercedes can rely on the same subsidies that other Russian producers have," Azat Timerhanov, representative of "AUTOSTAT" analytical agency, said to RBTH. He stressed, though, that it is too early to talk about the benefits, as the plant is not built yet. In 2016, the growth in demand for foreign cars assembled in Russia has been seen in CIS countries and the Middle East, commented Timerhanov. "The promotion of exports is getting special attention now," he stressed. For example, Nissan plans to deliver its model Datsun, which is assembled in Russia, to the Middle East, and Hyundai plans to export cars produced in its St. Petersburg plant to Georgia and Tunisia. A representative of Renault indicated the French auto manufacturer plans to export its Dacia Logan and Sandero Stepway models, both assembled in Moscow, to Vietnam. Russia’s domestic auto market is not attractive to international manufacturers due to declining sales since early 2015. According to Vladimir Bespalov, VTB Capital analyst, Russia has the capacity to produce 3 million cars right now, but the market demand is estimated at less than 1.5 million. "Capacity utilization comprises approximately 40%," he commented.